Hello everyone! I was so excited when my sweet friend Paige asked me to do a guest blog for her about skincare. So to briefly introduce myself I have been an esthetician for the past 20 years and have spent the last 10 years working as a Medical Esthetician, in a plastic surgery office. Two years ago I started my own skincare blog http://www.esthetician850.wordpress.com to help educate my clients and hopefully other lovely people like you, on how to care for your skin. I decided to target this post towards young Mamas like Paige, that have a lot on their plate and need the less is more approach. Skincare can be all too overwhelming, even for a skincare junkie like myself. With so many products available, all promising miracles it’s no surprise many shy away from even starting a solid skincare routine. I have some clients that feel they barely have time to brush their teeth in the morning when they are trying to fulfill the role of supermom, so they would just laugh in my face if I tried to send them home with a complicated routine to do morning and night. Hopefully I can simplify some things so you will know better what to focus on to still see results. 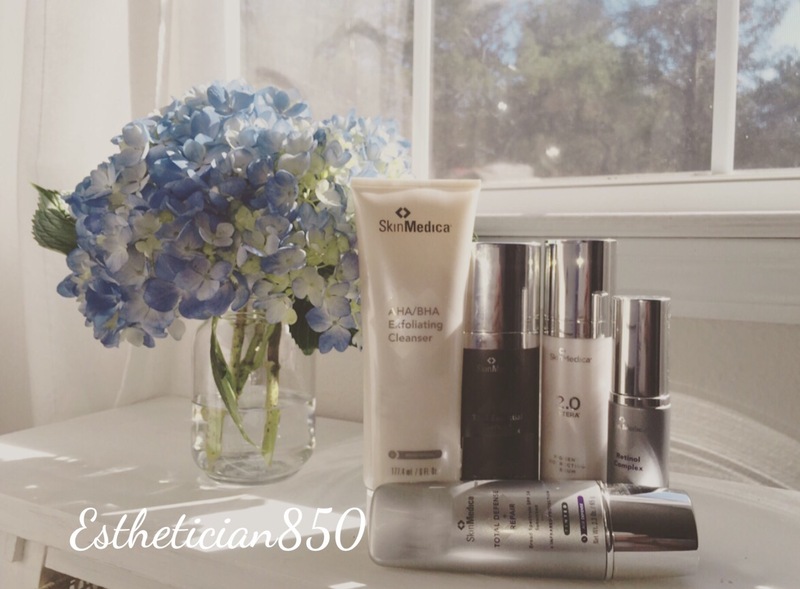 I must admit I have personally used and worked with many different skincare lines over the years but I have to say SkinMedica is my personal favorite line, so the products I am going to highlight will be from this company but I will explain what ingredients to look for in products so you can find your own alternatives. Please keep in mind if you are pregnant or nursing you must consult with your doctor before starting new skincare products as certain ingredients must not be used during this time. Let’s start of with one of the essentials for pretty, glowing skin. Just as you dust your house to keep the cobwebs at bay you need to do the same with your skin. Lack of exfoliation will lead to dull, uneven, congested skin. Save yourself a step by incorporating exfoliation into your daily cleansing routine. I use a cleanser that contains microbeads and exfoliating acids like AHA and BHA acids to dissolve the build up that gets stuck inside my pores. You don’t have to be harsh when it comes to exfoliating. Scrubbing at your skin the way you do your dirty pans is not the key to exfoliating. It will only lead to a red face and broken blood vessels. Let your products do the work for you. Another great product to use for exfoliation is a retinol or /retinoid product. Ask most estheticians and dermatologists for the gold star product of their skincare routine and this will usually come top of their list. This multi tasking product can be used nightly and helps address many issues such as uneven skin texture, pore size, fine lines/wrinkles and discoloration. The key with a product like this is to slowly incorporate it in your night time routine. This ingredient can cause dryness so you don’t want to over do it and use to much, too often, until you see how your skin responds. A lot of my clients are concerned with uneven skintone. Hormonal changes from taking the pill or pregnancy can trigger these darkened patches to appear and is called Melasma. Sun damage can also result in increased freckles, brown spots or sun spots. The best at home treatment is a product targeted specifically for discoloration. Look for products that contain Hydroquinone, licorice extract, niacinamide, and Kojic acid work to inhibit production of melanin so that the areas that are darker will gradually lighten and fade. 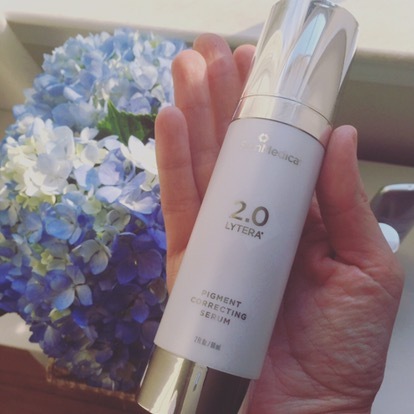 One of the newest ones to hit the shelves is Lytera 2.0 from SkinMedica. It’s light consistency is perfect for all skin types and results can be seen around 10-12 weeks of use. Exfoliation will also aid in speeding up results , which is why a retinol can enhance results. Anytime you are having issues with discoloration it is so important to use a good SPF as part of your skincare routine which I will discuss later. I don’t care what age you are this is the one thing we all want our skin care products to provide, is anti aging. In order to achieve this you want to look for products that stimulate and boost collagen production and protect the existing collagen and skin cells from damage. Key ingredients to look for in these products would be antioxidants such as vitamin C, growth factors, hyalouronic acid, retinoids/retinols and peptides as well as SPF. It always makes life so much easier when you can find products that multi task which is why I love this product. SkinMedica TNS Essential Serum is a powerhouse cocktail of 6 different antioxidants, pure growth factors (protein for your skin to build collagen) hyalouronic acid for hydration and peptides for firming just to name a few. Again it can be hard to find a product that contains all these factors without having to use multiple items. This product is one of the latest sunscreens to hit the market that incorporates antioxidants to reverse sundamage that has already occurred while protecting from future damage. For anyone suffering from melasma, this unique product helps to protect from the the infra red rays that penetrate the skins deepest layers and heat the tissue which often makes the melasma look darker. I tell all my clients this is sooooo much more than just a sunscreen. Again these are just a few of my personal favorites but the right ingredients and quality ingredients are key to seeing results. As with dieting or exercise, consistency is key. You can’t expect to see results over night. If you can find an esthetician and treat yourself to monthly or bi monthly treatments it can really help to keep you on track with your home care routine and they will help to tweak your routine if needed. No matter how busy life gets, if you can manage 2 minutes (literally 2 minutes) morning and night to apply a few products, your skin will thank you, especially 10 or 20 years from now.